Raffle and Hourly Door Prizes. Games and Prizes (Education Room) For Children. Displays Of Handcrafted Jewelry Designs And Collections Of Unusual Minerals, Fossils, Geodes And Rocks. Sales Booths Featuring Faceted and Cabochon Jewels, Fossils, Geodes, Tools, Findings, Slabs, Finished Jewelry And Gifts. Increase our appreciation of the beauty and value of the land in which we live. Foster good fellowship among its members. 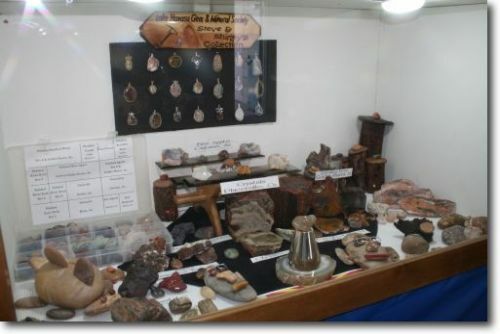 Host an annual Gem and Mineral Show for the community. a. Increasing knowledge pertaining to minerals, gems, and rocks. b. Disseminating knowledge of collecting and classification of minerals, fossils and rock through collection and classification. c. Improving the practical knowledge of cutting, grinding and polishing materials touse in the design and creation of jewelry and other useful objects. Provide educational scholarships in the scientific fields. Procure and improve the Society’s property. Next PostNext Houston Gem, Mineral, Jewelry, Fossil Show is Nov 9-11!